Writers' Blog: What's your PoV? PoV, or Point of View, as it is known 'in the biz' is something you may or may not be aware of as you write, but can have a huge impact on what, and how, you write. I don't like banging on about my books on this blog - I don't want this space to be all about the stuff I've written, but in this instance I'm going to talk about Torn. Torn is written in the first person - that is, it's the story of Alex Broughton, from Alex's point of view. Before I'd even begun writing, I'd seen the story play out from Alex's PoV and didn't consciously think about it too much. But as the writing process got underway, I had to pause to consider what it would mean. For example, Alex was raised in rural Yorkshire. She has limited life experience and although she is well educated, she has led a relatively sheltered life. What this means for me as a writer, is how much can I really show and tell when writing from such an angle. Think about this: if you were living in the eighteenth century, you could never imagine such a thing as a computer. So, to a much lesser extent, of course, Alex's limited experience meant that there were certain things she couldn't imagine. This threw up quite a number of problems for me during the writing of Torn because it meant that there were things that Alex either didn't know, didn't understand, or couldn't fathom, such as Patrick's rather adventurous lifestyle. She knew about his drinking and womanising as theories, but didn't know what was truly involved, or the extent. I could only show what Alex did know, so the reader was forced to remain in the dark with everything else. At one stage I stopped writing and thought about the consequences of this - what it would mean to limit how much information I could give the reader, and would it impact the reader's experience? If I decided to continue writing from Alex's PoV, I would, of necessity have to be very detailed in what she did know, and allow everything outside Alex's sphere to be a mystery - perhaps to be discovered later. That's real life though isn't it? As individuals, we only know what we've experienced for ourselves or had explained to us. Another example can be found on page 96. Grace is an Italian girl who, with her sister and mother, is visiting the Broughton family. During a short conversation with Patrick she says, "Allora, vedi ho ragione." Patrick responds, also in Italian, "Forse ma, chi sa?" The general rule for dropping foreign language into prose is that you write contextually, or provide a translation so that readers understand what is being said. I chose to break the rule and not provide a translation. Even my editor asked me about this and suggested I provide the readers with a translation. I argued, and eventually won my case, saying that it's Alex's PoV and as she didn't understand Italian, it would take something away from the authenticity of the story if I provided the reader with a translation - especially given that so much else that Alex didn't know or understand remained unexplained. I enjoyed writing the story in this style but it did mean that there was an awful lot that I knew about the other characters - and what they got up to - but couldn't share with readers simply because Alex was unaware. It was important to me, and the story (and you'll know why if you've read Torn) that readers saw everything only through Alex's eyes. There were things about Patrick we knew. We knew he was a bit of a player and led a rather sordid life for one of his age (although his behaviour was typical of young, wealthy, titled men of the day). What we didn't know was what motivated him, what he thought of the other characters in the story and why. Most importantly of all, what did he think of Alex and when, and why, did he begin to feel fondly toward her? I started to think that Patrick had a right to be heard. A reader emailed me a while back with a number of questions pertaining to Patrick's behaviour - I won't tell you what she asked because I don't want to give the game away! Suffice to say, I realised that people were curious about Patrick, much in the same way that Alex was curious. To address this, I have decided to write a series of short stories from Patrick's PoV. Occasionally, I'll throw in a story from someone else's PoV just to keep it interesting. I've begun writing them and am thoroughly enjoying the new challenge - even if I catch myself blushing from time to time - after all, Patrick's lifestyle is vastly different from Alex's. There's swearing and lots of rudie bits. Fun to write but waaay out of my comfort zone; they're proving to be a terrific writing exercise! The stories will be released to fans of Torn for free. They will be made available on the 15th of each month beginning in January 2014. To subscribe click here or hop on to my website. As I mentioned, the content is a bit risque, so you'll need to confirm you're aware and ok with that before you start reading. Well, that's all from me this week. I hope this topic is interesting ... I have always enjoyed reading books in first person and it's certainly a fun writing experience. 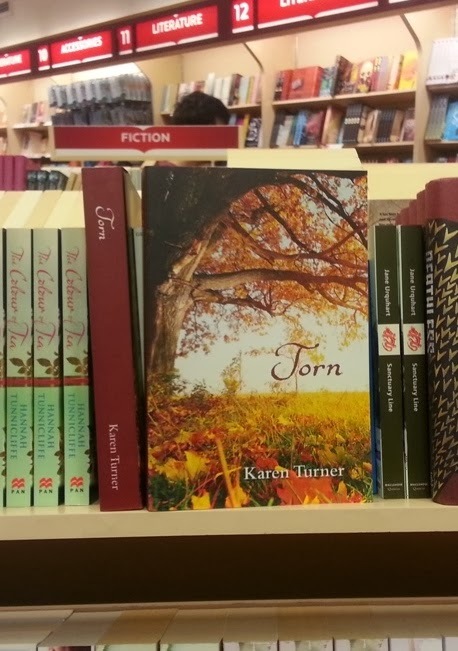 This is Torn, sitting proudly on the shelves in Dymocks George Street, Sydney.